To order your personalized monogram piece, please provide the initials in the order that you would like to have them placed on the monogram. Example : Jane Elaine Smith would be ordered as "JSE" to appear JSE. As shown on a number of the rings in our Monogram selection, the proper way to order a monogram is to have the initial from your Last Name appear in the middle, so if your name was Sarah Renee Park, it would appear SPR. *** You may order your Monogram in any order you please. 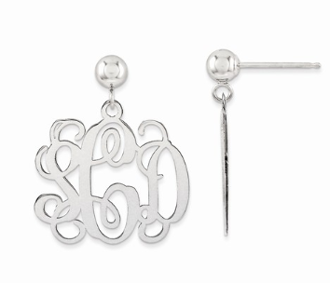 Just note that you will input the letters IN THE ORDER you wish to see them appear on your monogram. Please note that any orders that have been custom made, personalized, and / or engraved as requested are final sale and are non returnable and are not eligible for a refund or exchange. What is Carat Total Weight (ct. t.w.)? Carat Total Weight (ct. t.w.) refers to the total weight of all diamonds set in the jewelry item. For example, in order to calculate the ct. t.w. of a three stone ring, one would take into consideration the center diamond as well as the two side stones. Diamond carat weights (CT.), total weight (T.W.) of all diamonds, weight and dimensions of jewelry, color, clarity, carat and quantity of diamonds all represent the approximate in each setting and may vary than what is stated. Typographic errors are subject to correction. Merchandise enlarged to show detail and may not always be exactly as pictured. Promotions, prices, styles and availability may vary by store and online.